Silicoflagellates are primarily marine mixotrophic (photosynthetic as well as heterotrophic by phagocytosis) biflagellated phytoplankton. Only one flagellum is distinctive as a means of propelling the unicells; the other is apparently insignificant. The class is characterized by producing a skeleton network of silicaceous rods, some (including Dictyocha) also include spines. Microfossils are found in sediments that date to the early Cretaceous (from ~ 150 mya). Maximum diversity of fossil silicoflagellates was 23 – 25 Mya (Tappan 1980). The silicoflagellates, diatoms and some sponges are the only organisms to use silica instead of calcium for their skeletons, and the Synurophyceae produce silica spines. Advantages of silica include greater tensile strength and low dissolution rate. The strength of quartz (silica based) over limestone (calcium based) is evident. Skeletons of silica can have a lattice construction of sufficient strength to be much lighter in weight than a solid surface or thicker sections required of a calcium skeleton, thus sinking rate of silicon-based organisms can be minimized (McCartney and Loper 1989). The Dictyochophyceae include only three extant genera, Dictyocha, Pedinella and Pseudopedinella. In freshwater, Pedinella (Order Pedinellales) forms a sessile colony of unicells that can become planktonic (Kristiansen 2002). Extensive HPLC pigment analysis of Dictyocha speculum indicates a similarity to a group of haptophyes, closer than to pedinellids (Pedinella) suggesting a failure of pigment signatures in marine plankton to separate D. speculum, and overestimating the biomass of haptophytes (Daugbjerg and Henriksen 2001). An article by Richard T. Carter (Hebei Normal University, Shijiazhuang, China) containing several photographs of Dictyocha and extinct genera can be found online and updated. Daugbjerg, N., and P. Henriksen 2001. 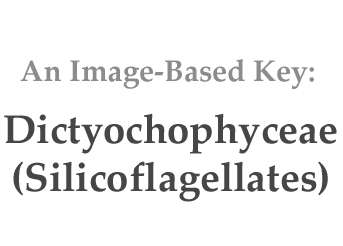 Pigment composition and rbcL sequence data from the silicoflagellate Dictyocha speculum: a heterokont alga with pigments similar to some haptophytes. Journal of Phycology 37:1110-1120. McCartney, K., and D.E. Loper 1989. Optimized skeletal morphologies of silicoflagellate genera Dictyocha and Distephanus. Paleobiology 15(3):283-298..
Kristiansen, Jorgen 2002. Phylum Chrysophyta (Golden Algae). In: The freshwater algal flora of the British Isles (pp. 214-244). Tappan, H. 1980. The Paleobiology of Plant Protists. Freeman, San Francisco, 1029 pp.